Thank you to Dave Pattison of Edinburgh for sending me the photograph above. Dave believes that this photograph is probably of Jerome's studio in Leith Street, Edinburgh. Dave's grandmother used to be Manageress of Jerome's Leith Street and also worked in other branches of Jerome. The Leith Street branch of Jerome operated from 1934 until 1970. When might this photograph have been taken? "The first thing our mother done was to give you sixpence to go up to Jerome's to get your photograph taken, and everybody got their photograph taken at the same pillar. It was a big pillar." "I recognised a shot in Jeromes Studio - a white pillar with black banding in the background. I have a photo of myself dated 1936 with that background." "My grandmother Mary Harrison of Holyrood Road, Edinburgh worked as a re-toucher at Jerome's Edinburgh studio during World War II." Liz used to live in Edinburgh but has now lived in California for over 40 years. "I remember Jerome's photographic studio in Edinburgh very well. Everyone in Edinburgh who had their photo taken there, male or female, either sat on the chair or stood by that pillar. I was at sea when Jerome's shut in Leith Street and I wonder what happened to the pillar and chair, I remember knocking the pillar over one day as it was a prop and made of a cardboard substance, but he did not mind. I also got my passport photos done there." Thank you to Valerie Mills, formerly of Edinburgh, now living at Luss beside Loch Lomond, who wrote about a photograph taken around 1958. 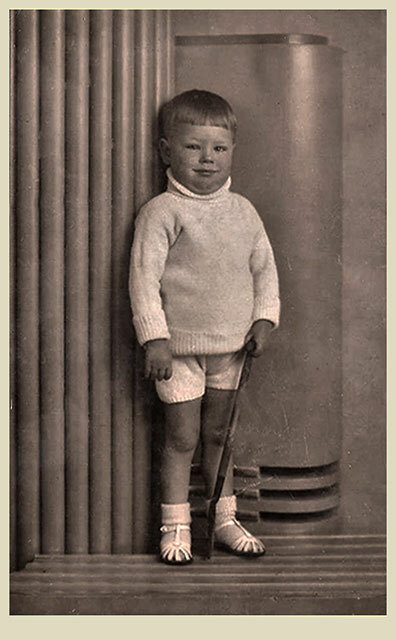 "I have a photograph of myself taken at Jeromes in Edinburgh when I was 6 months old. My Mum tells me that in those days, Jeromes would not photograph a baby unless they were able to 'hold their own heads up' (and basically not fall over like a floppy doll). But when my Mum went into enquire, it turned out that she knew the Receptionist from school, so the photo of me was taken with this girl squatting behind the block I was sitting on, and holding me upright. It was my Mother's pride and joy for years, but she gave it to me a few years ago, and it has been put away in an Album, to keep it flat and safe. It still has a few bits or remaining tissue paper from the cardboard mount." "I worked there in 1959. In fact I started on my 16th birthday. Saturdays were usually our very busy day and the metal spiral stairs to the basement stick in my mind as I had to race up and down between the studio and darkroom." "Just a wee point of interest. All the people of my generation will recognise the dance hall next to Jeromes in Leith Street. It was Fairley's, a very daring place for us young things to go." Jerome is listed at 79 Leith Street in the Edinburgh Post Office Directories from 1934 until 1974, the last year that the directories were published. However, it appears that Jerome had moved out of their Leith Street premises perhaps as early as 1970, or perhaps in 1971 or the following year. The Valuation Rolls list William McNally at 79 Leith Street in 1971. Was he acting on behalf of Jerome then? Thank you to Maureen Sheppart for leaving a message in the EdinPhoto guest book. "My Dad, William McNally, worked as Photographer in Jerome's Studio in Edinburgh in the 1950s-60s I have some fond memories of the time I spent at the studio. I had many pictures taken there. My Mum and Dad hand-coloured Jerome photographs. That was before colour photography was used. My Dad worked in the Aberdeen branch before being transferred to Jerome's in Edinburgh. I'm sorry, now, that some of the coloured photos have been lost, as the hand painted ones were beautiful. I do still have some of my Mum. It certainly was an art in those days. I emigrated from Edinburgh to Canada in 1967. Leith Street looked so different the last time I visited Edinburgh." Message posted in EdinPhoto guest book: February 2, 2009. 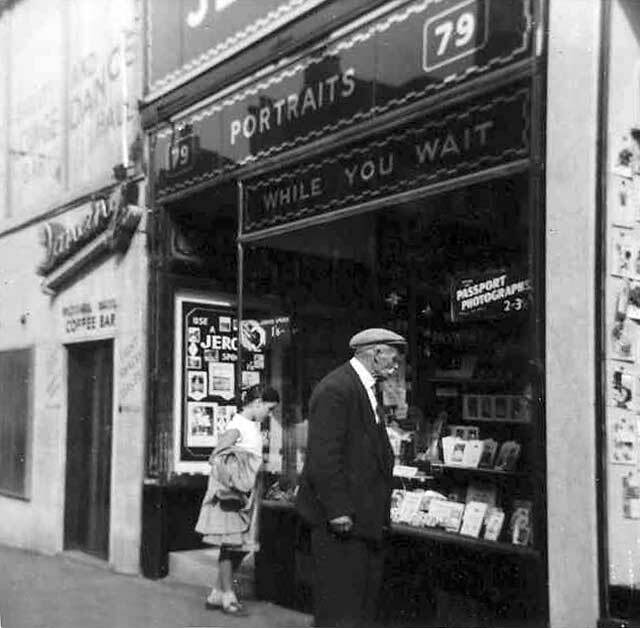 "The picture of Jeromes would have been taken in the late-1950s or early-1960ss as it advertises passport photos. In those days the Passport Office for Edinburgh and area was in Rose Street." The premises next door was Fairleys Ballroom. It was a popular place with members of the forces in the 1940s and as a child I thought it must be a really fun place, judging by the numbers who entered." "I remember many visits to Jerome's, and have a number of photos in the chair by the pillar with my brothers and sisters. There was always a queue waiting to have their photograph taken people from all walks of life." "I see that in recollections above, Maisie Knox and Eric Gold recalling the props and pillar they used in their studio photographs. Here is a photo of my Father (circa 1935) taken at Jerome's studio. He is standing next to a pillar, holding a toy spade. - I wonder if anybody recognises this pillar in Jerome's Studio. - In which studio in Edinburgh the photo might this photo have been taken?" I believe that Jerome only ever had had one studio in Edinburgh. It was this one at 79 Leith Street. It was in business from around 1934 until 1970, so the photo pillar must have been just about new when the photo of your dad was taken! I'm sure that would be the studio where the photo of your dad was taken, and also the studio remembered by Maisie and Eric. Eric replied to the comments that Donald Graham wrote in Recollections 11 above, about the pillar at Jerome's studio. "Yes, that is the same pillar as I knocked over a thousand times (ha ha ha ha). It would have been a treat if the old chair was there too. That was a blast from the past! I wonder what happened to those old props. They should be in Edinburgh Museum." Thank you to Gordon Davie for sending me another photo taken at Jerome's Studio in Edinburgh. "I've just been reading the new recollections of Jerome's photographic studio in Leith Street and the props they used. 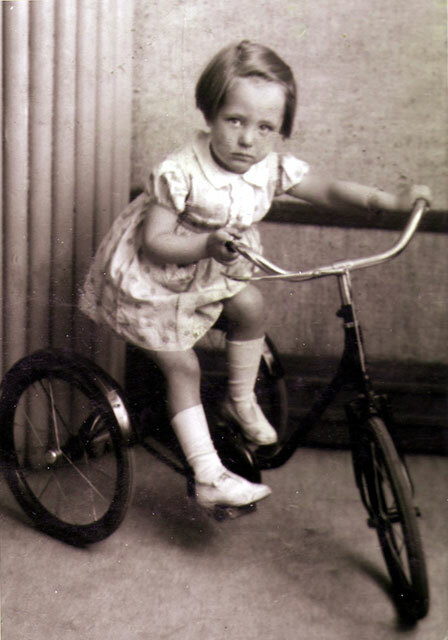 Here is a photo of my late mother, Ellen, sitting on a tricycle. For many years I assumed it belonged to her, but I was told that the photo was actually taken in Jerome's and the pillar in the background proves it. Going by her apparent age, it would have been taken around 1939-40." © Reproduced with acknowledgement to Gordon Davie, son of Ellen Davie on the tricycle above. Thank you to Valerie McKay for sending me this copy of one of her photos from Jerome's studio in Edinburgh, together with her comments about it (below). 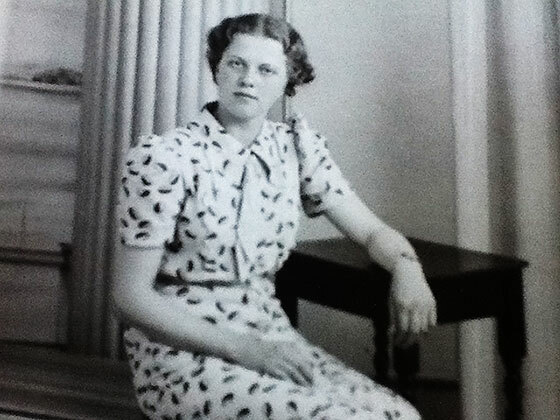 "This is a photo taken of my mom at Jerome's on July 21, 1938, just 4 days before her 16th birthday. She passed away last week and I found this photo in a box. She was in her 92nd year. My mom was from Leslie, Fife, one of a family of 8 children. Money was scarce, so this photo was a prized possession. Indeed, even trips to Edinburgh were few and far between. The photo was taken at Jerome's studio in Edinburgh while my mother was visiting her older brother, John Peggie who worked for The Scotsman. I suspect he paid for it as gift for her 16th birthday. This photo is a great memory for herself and her grandchildren. Thank you! Later, in 1947, my mom had ID photos taken at Jerome's for her trip to Canada to meet her Canadian husband who had carried a similar photo throughout the war for luck! It worked! "I worked for Mr Mcnally at Jerome's. - I'm trying to remember the lady who was Manageress but her name escapes me. It was a long time ago. I was probably about 16 years old when I worked there. - I remember the man there who was teaching me retouching. He was European but I cannot remember his name. Maybe it was Max. - I think the manageress lived in Prestonpans. - One of the Jerome girls also lived there. - If I remember any more names, I'll let you know. - I helped develop photographs and was learning to retouch negatives. I remember the developer for the photos. It e our nails up.